Dragus Maximus, Heartbeat Opera, 2018. Photo: Russ Rowland. 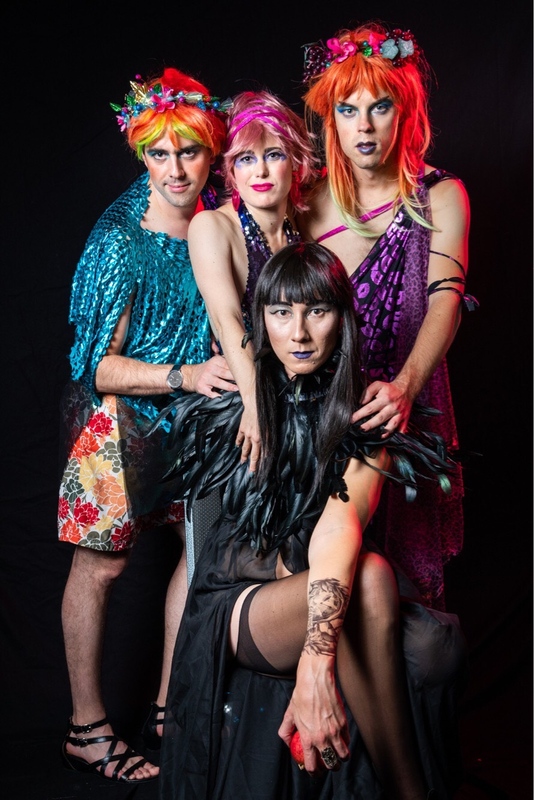 Heartbeat Opera’s Dragus Maximus: A Homersexual Opera Odyssey was a treat for the eyes and ears and an appeal to the Love that unites us, of which we must constantly be reminded. The show, a revue of Baroque arias and a world premiere by music director Daniel Schlosberg, incorporated masterful singing, a costumed 6-piece band, gender bending, lip syncing, imaginative costumes and dazzling makeup in the intimate venue of Roulette Theatre in Brooklyn. 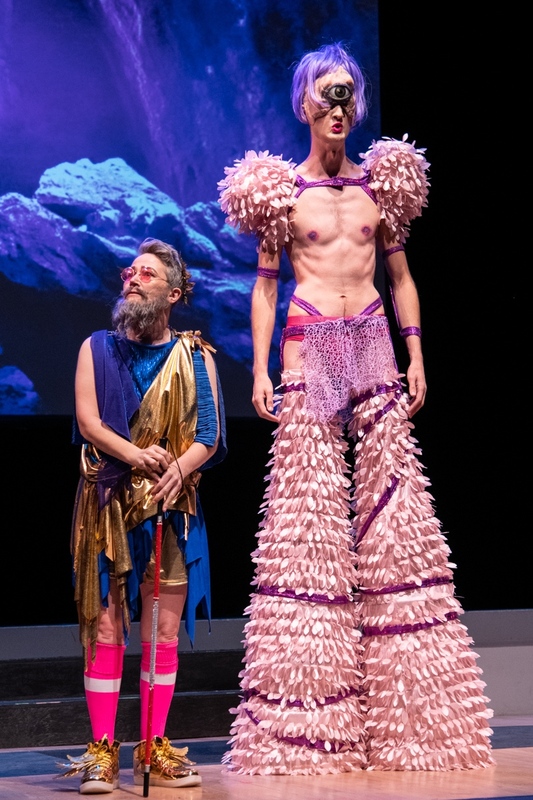 The campy banter between the show’s narrating duo, the poet Homer (of the Iliad and Odyssey) and a voice of God portrayal of Goddess Aphrodite kept the mood light and navigated us skillfully between each disparate piece of musical drama. Bass-baritone John Taylor Ward’s performance of “Fra l’ombre è gl’orrori” set a mournful tone. The singer emerged on stage; he was made monstrously tall by stilts, hidden under a frilly pink pant, and with a cyclops mask obscuring the top of his face. Far from letting these accoutrements steal the moment, Ward employed them to deepen the vulnerability of his wounded, beautiful monster, Polyphemus. 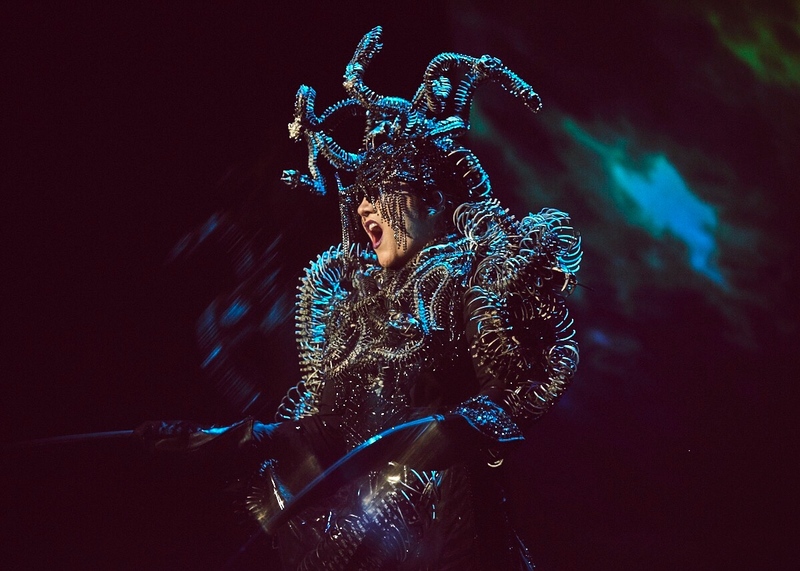 Dragus Maximus, Heartbeat Opera, 2018. Photo: Andrew Boyle. Soprano, Nicolette Mavroleon sang a virile and playfully menacing Nero with her aria “Come nube che fugge dal vento” from Handel’s Agrippina. Her fioratura was impeccable and she never yielded the suggestive sparkle in her eye or in her tone. Contralto Sara Couden’s warm earthy tone caressed us through “Where shall I fly?” from Handel’s Hercules with well sung coloratura, robust with shifting dramatic intent and full of vocal colour. Her performance oscillated between moving sincerity and ironic silliness. Soprano, Jamilyn Manning-White offered us the world-premiere performance of “Feed the Snakes” by Music Director Daniel Schlosberg with lyrics by Royce Vavrek. The piece shows us another side of Medusa. It begins with harsh, angular stridency, confirming what we think we remember about the mythical Medusa but becomes heartbreakingly lyrical as we begin to sympathise with the poor wretch whose beauty was unjustly maimed by the jealous goddess Athena after Medusa was raped by the god Poseidon. Ms. Manning-White and the on-stage orchestra performed with tremendous clarity and accuracy. Clockwise from left: Jacob Ashworth (Music Director), Louisa Proske (Artistic Director), Daniel Schlosberg (Music Director), and Ethan Heard (Artistic Director), creators of Dragus Maximus, Heartbeat Opera, 2018. Photo: Russ Rowland. The ensemble closed their review with a rousing “All you Need is Love”. The artistic team is to be congratulated for striking the balance between spectacle and art, sensation and sincerity, innovation and tradition.